Late at night on October 1, 2017, a horrific event took place. 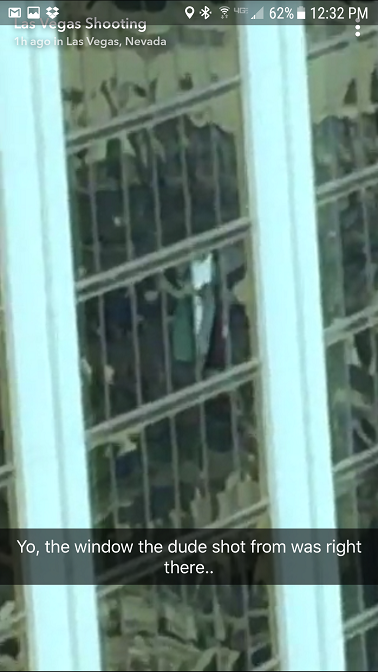 A 64yr old man, Stephen Paddock, holed up in his hotel room at Mandalay Bay, opened fire on people having a good time. At this point, the media is still trying to figure out if he was in debt from gambling or just a complete psychopath. It was 2:30AM Eastern Time when I heard of the tragedy. I wanted news, and I’m sure people all over the world wanted news as well. While I was sunk into my chair, people were extremely worried about their loved ones and wanted to know what the heck was going on and to see if their parents, children, spouses, brothers and sisters were OK. Others wanted to know if this was an act of international terrorism. 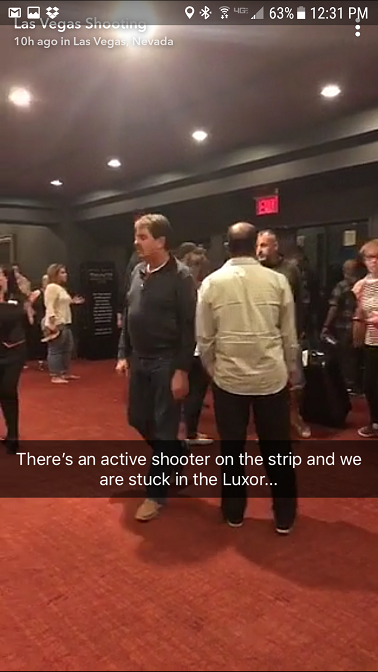 And, people on the Las Vegas strip wanted to know if there were multiple shooters and if they themselves were ok. A quick rumor circulated Twitter that there was also a shooting at the Tropicana and the New York New York; fortunately this was not true. Social media can provide this news much faster than the media can. Indeed, on Twitter I was able to see short video clips and heard what sounded like automatic gunfire. An app called Yik Yak pioneered the ability to see posts from one geographical area in 2014 with a feature called Peek, but the app has since closed. 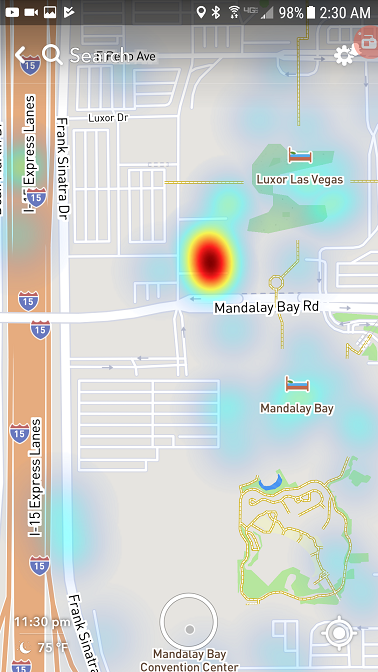 Immediately, I knew the best place to get a video feed of the event would be from Snapchat, thanks to their new Snapchat Maps feature. However, the “our story” feature is curated by humans, so there was nothing to see immediately. To add stories to “our story” and appear on the Snapchat Map, users upload videos publicly and tick a box for “our story”. This could indeed be very helpful to others in these types of events. 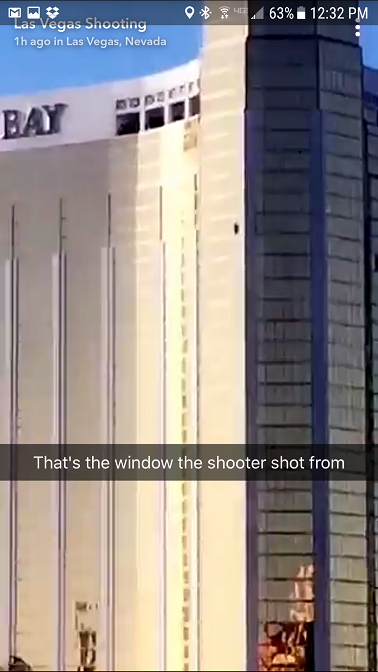 How can I see the Las Vegas Shooting Snapchat Story? Update: Snapchat stories only last 24hrs. 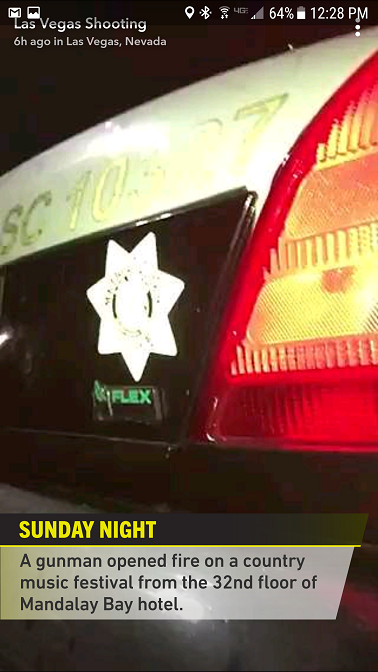 You can still see the Snapchat story on YouTube here. Facebook launched a crisis response page (requires login). 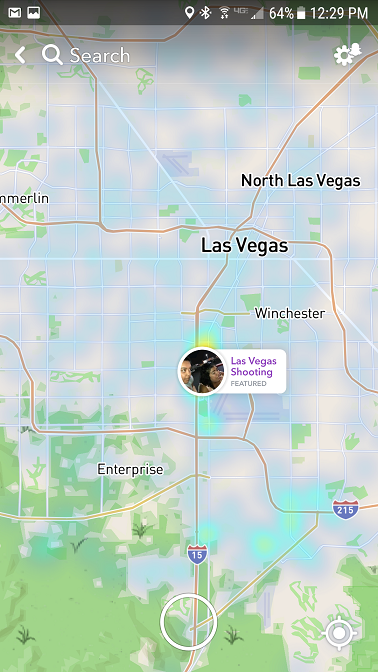 What do you think of the Las Vegas Shooting Snapchat Story? Did it go up too slow? There are only a handful of snaps yet I bet thousands were uploaded. Do they need to add more content? Update: A GoFundMe page has been set up with a $10,000,000 goal. If you are reading this, please consider donating generously. I think Snapchat should have published the stories much sooner. BTW Mashable copied your article. Hah! 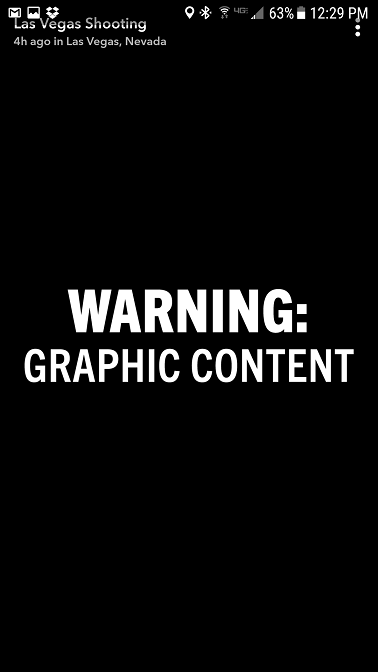 I see the Kerry Flynn article. Yeah that is very similar. I agree. The Snapchat Stories are far too slow. I was looking for the story when it was still taking place. I didn’t see it for 7 hours.